The Model GX-2012 confined space monitor has advanced design features for general industrial confined space entry, as well as enhanced capabilities for purge and barhole testing for pipeline companies and gas utilities. 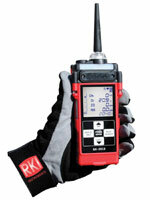 The GX-2012’s large LCD screen shows all gas readings, the battery level and current time. It will automatically backlight in alarm conditions.